Instrument tests offshore San Diego produced enough data for a nice study examining the combined use of marine MT, marine CSEM, gravity, and seismic data for basin characterization. This work was written up as "Mapping Offshore Sedimentary Structure Using Electromagnetic Methods and Terrain Effects in Marine Magnetotelluric Data". If you want to do 3D modeling of the bathymetry effects, you can get bathymetry data from the NGDC Coastal Relief Model. Just click on the "Create Custom Grid" button. Figure 10. Inversion of MT data (color pixel-plot) overlain on USGS seismic line 112 (black pattern). Also shown as blue lines and densities (blue and white numbers, kg/m^3) is the model derived from surface and deep-towed gravity by Ridgway (1997). The vertical colored bar outlined in black is a representation of the CSEM model for the southern transmitter tow, shown in Fig. 3. Vertical exaggeration is 4:1. Figure 1. Regional map of the study area, showing MT stations (S06, S07, etc. 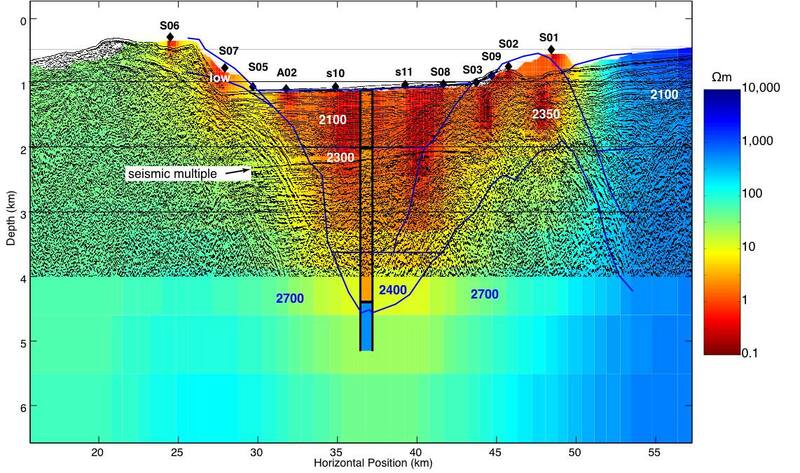 ), CSEM receiver (`LEM'), CSEM tow line, and deep-towed gravity line (in yellow) of Ridgway and Zumberge (2002). Also shown are the main structural features of the area. 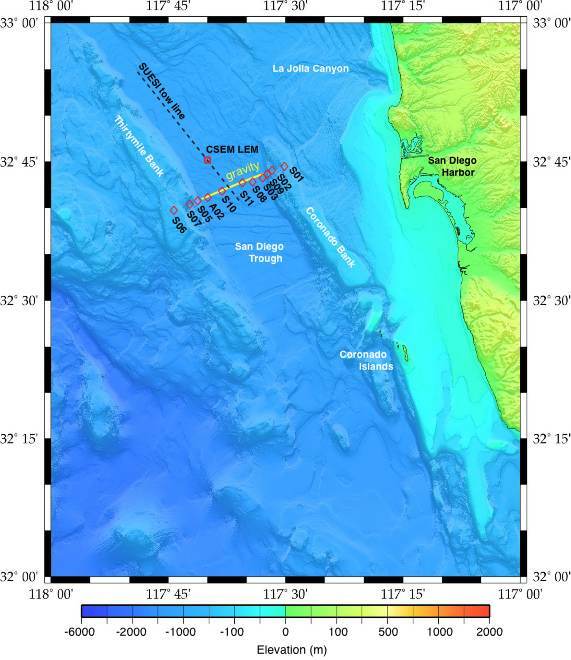 The San Diego Trough is a 10~km wide, 1,000~m deep sediment-filled graben bounded by the Thirtymile Bank to the west and the Coronado Bank to the east. The flat, sedimented sea-floor, combined with the close proximity to San Diego harbor, make the Trough a convenient place to develop marine instrumentation. Bathymetric map courtesy of the National Geophysical Data Center.